Are Activist Investors Good for the Pharmaceutical Industry? Activist investors are hitting the headlines every week. To quote an old Canned heat Song - "Let's work together"! Deal making during 2017 has been quite volatile in the sense that six months into the year, the volume and values are showing a down turn in comparison with the same period in 2016. This could be due to the ongoing political instability which is, in turn, causing companies to be more circumspect in their investments. In the US the much vaunted change in corporate tax rates has yet to emerge so the US pharma companies continue to hold large cash amounts overseas. In the meanwhile, the stock markets continue to grow but some companies find themselves in difficulty. AstraZeneca’s share price fell by 10% in July when one clinical study failed to meet its endpoint. Similarly BMS’s share price is 25% lower than last year. The volatility in share prices is partly a result of shareholder activism â€“ but is this activity good for the industry? This topic is reviewed in the article on Activist Investors. A more philosophical look at partnering is taken in the Thoughts on the Natural History of Cooperation and we stay with soft skills in the article from AstraZeneca on the Role of Communication in Deal Making. 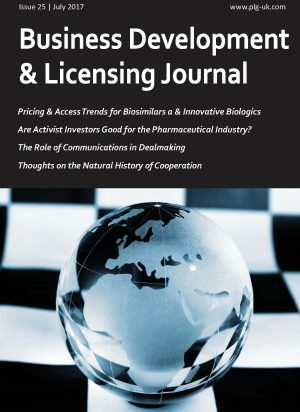 But notwithstanding this, business goes on and we complete this issue with an update on the perennial area of interest -pricing; this time focusing on Biosimilars and Innovative Biologics. In the UK there is the interesting situation where Merck is being accused by the Competition and Markets Authority of offering a discount scheme that may have restricted competition for cheaper biosimilars of infliximab. In other words the UK wants biosimilar competition to reduce the costs of expensive antibody treatments but not too much! Our next issue will be including articles based on the topics being presented at the IPLS conference in Madrid this September so watch out for updates on Brexit, Digital Health, Good Partnering Practices and much more!